The Porsche 968 is a sports car sold by Porsche AG from 1992 to 1995. It took over the entry-level position in Porsche’s lineup from the Porsche 944, with which it shared about 20% of its parts. The Porsche 968 became the final model in an evolving line, starting almost 20 years earlier with the introduction of the Porsche 924 and ending with the Turbo S, Turbo RS, and Turbo RS Lemans, which are three separate versions of the Porsche 968. Porsche’s 944 model debuted for the 1982 model year, was updated as “944S” in 1987 and as “944S2” in 1989. Shortly after the start of production of the S2 variant, Porsche engineers began working on another set of significant upgrades for the model, as executives were planning a final “S3” variant of the Porsche 944. During the development phase, 80% of the 944’s mechanical components were either significantly modified or completely replaced by the engineers, leaving so little of the outgoing S2 behind that Porsche management chose to introduce the variant as a new model, entitling it Porsche 968. In addition to the numerous mechanical upgrades, the new model also received significantly evolved styling both inside and out, with a more modern, streamlined look and more standard luxury than on the Porsche 944. Production was moved from the Audi plant in Neckarsulm (where the Porsche 924 and Porsche 944 had been manufactured under contract to Porsche), to Porsche’s own factory in Zuffenhausen. The Porsche 968 was powered by an updated version of the Porsche 944’s straight-4 engine, now displacing 3.0 L with 104mm bore, 88mm stroke and producing 240 PS(236 hp/177 kW). 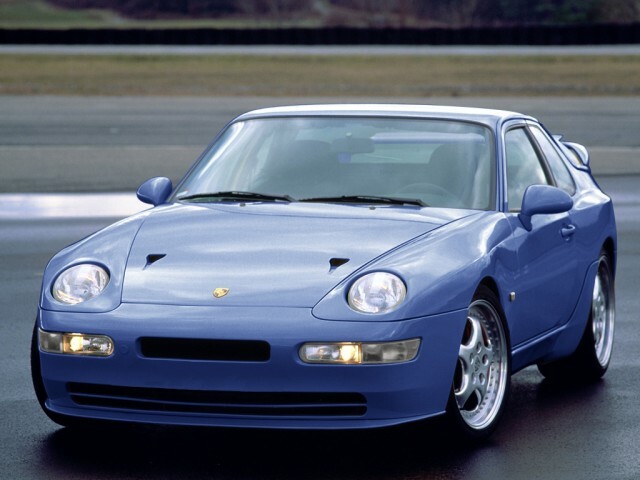 Changes to the Porsche 968’s power train also included the addition of Porsche’s then-new VarioCam variable valve timing system, newly-optimized induction and exhaust systems, a dual-mass flywheel, and updated engine management electronics among other more minor revisions. The Porsche 968’s engine was the second-largest 4-cylinder ever offered in a production car up to that time. A new 6-speed manual transmission replaced the Porsche 944’s old 5-speed, and Porsche’s dual-mode Tiptronic automatic became an available option. Both the VarioCam timing system and Tiptronic transmission were very recent developments for Porsche. The Tiptronic transmission had debuted for the first time ever only 3 years prior to the debut of the Porsche 968, on the 1989 Porsche 911 (Porsche 964). The VarioCam timing system was first introduced on the Porsche 968 and would later become a feature of the Type 993 air cooled six cylinder engine. The Porsche 968’s styling was an evolution on that of the outgoing 944, itself styled evolutionarily from the earlier 924, but elements were borrowed from the more expensive928 model in an attempt to create a “family resemblance” between models, and the swooping headlamp design, inspired by those of the 959, previewed similar units found later on the Type 993 911. Along with the new styling, the 968 featured numerous small equipment and detail upgrades, including a Fuba roof-mounted antenna, updated single lens tail lamps, “Cup” style 16″ alloy wheels, a wider selection of interior and exterior colors, and a slightly updated “B” pillar and rear quarter window to accommodate adhesive installation to replace the older rubber gasket installation. Because some parts are interchangeable between the 968, 944 and 924, some enthusiasts purchase those parts from Porsche parts warehouses as “upgrades” for their older models. Like the 944, the 968 was sold as both a coupe and a convertible. Much of the 968’s chassis was carried over from the 944S2, which in itself shared many components with the 944 Turbo (internally numbered 951). Borrowed components include the Brembo-sourced 4-piston brake calipers on all four wheels, aluminumsemi-trailing arms and aluminum front A-arms, used in a Macpherson strut arrangement. The steel unibody structure was also very similar to that of the previous models. Porsche maintained that 80% of the car was new. From 1993 through 1995, Porsche offered a lighter-weight “Club Sport” version of the Porsche 968 designed for enthusiasts seeking increased track performance. Much of the Porsche 968’s luxury-oriented equipment was removed or taken off the options list; less sound deadening material was used, electrical windows were replaced with crank-driven units, upgraded stereo systems, A/C and sunroof were still optional as on the standard Coupe and Convertible models. In addition, Porsche installed manually adjustable lightweight Recaro racing seats rather than the standard power-operated leather buckets (also manufactured by Recaro), a revisedsuspension system optimized and lowered by 20mm for possible track use, 17″ wheels (also slightly wider to accommodate wider tyres) rather than the 16″ as found on the Coupe and wider tires, 225 front and 255 rears rather than 205 and 245 respectively. The 4 spoke airbag steering wheel was replaced with a thicker rimmed 3 spoke steering wheel with no airbag, heated washer jets were replaced with non heated, vanity covers in the engine bay were deleted, as was the rear wiper. The Porsche 968 Club Sport has no rear seats unlike the 2+2 Coupe. Club Sports were only available in white, black, Speed yellow, Guards red, Riviera blue or Maritime blue. Seat backs were color coded to the body. Club Sport decals were standard in either black, red or white but there was a ‘delete’ option. 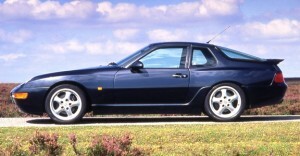 All Porsche 968 Club Sports had black interiors with the Porsche 944 S2 door cards. Due to the reduction in the number of electrical items the wiring loom was reduced in complexity which saved weight and also the battery was replaced with a smaller one, again reducing weight. With the no frills approach meaning less weight, as well as the optimizing of the suspension, Porsche could focus media attention on the Porsche 968 Club Sport variants fast road and track abilities. This helped to slightly bolster the flagging sales figures in the mid 1990s. The Porsche 968 Club Sport variant achieved a ‘Performance Car Of The Year’ award in 1993 from Performance Car magazine in the UK. Porsche 968 Club Sport models were only officially available in the UK, Europe, Japan & Australia, although “grey market” cars found their way elsewhere. A UK-only version called “968 Sport”, was offered in 1994 and 1995, and was essentially a Club Sport model (and was produced on the same production line with similar chassis numbers) with electric windows, electric release boot, central locking, cloth comfort seats (different to both the standard and the Club Sport). With the added electrics the larger wiring loom was used. The Sport Variant also got back the 2 rear seats, again in the cloth material specific to the Sport. At £29,975, the 968 Sport was priced £5,500 lower than the standard 968, but had most of the latter’s desirable “luxuries” and consequently outsold it by a large margin (306 of the 968 Sport models compared to 40 standard 968 coupés). Porsche briefly produced a turbocharged Porsche 968 sold as “Turbo S”, a fairly odd naming choice for Porsche which usually reserves the added “S” moniker for models that have been tuned for more power over a “lesser” counterpart, such as with the Porsche 911 Turbo which has infrequently been available in both “Turbo” and higher-performance “Turbo S” guise. Only 16 were produced in total and only for sale in mainland Europe. Tests conducted in 1993 produced a 0 to 60 miles-per-hour time of 4.7 seconds and a top speed of approximately 180 miles-per-hour, performance comparable to the much newer Porsche 911 (Porsche 996). A further stripped out version of the Porsche 968 Turbo S which was built for Porsche’s customer race teams between 1992 and 1994, this variant was available in two states of tune; a 337 bhp version which was built to the German ADAC GT specification and used the K27 turbocharger from the Turbo S, and an international spec version which used a KKK L41 turbocharger producing 350 bhp and was reduced to 1212 kg in weight (the ADAC GT version had to have ballast added to bring the car up to the 1350 kg minimum weight limit allowed by ADAC regulations). Only 4 were produced. The Porsche 968 was Porsche’s last new front-engined vehicle (of any type) before the introduction of the Porsche Cayenne SUV. Its discontinuation in 1995 coincided with that of the Porsche 928, Porsche’s only other front-engined car at the time. As of 2009, Porsche has not yet built another front-engined sports car, although a 4-door sports-touring sedan, called Porsche Panamera began production in 2009, and a successor to the Porsche 928, based on that sedan’s architecture, is predicted to follow. The Porsche 968 was also the last Porsche sold with a four-cylinder engine until 2011, when Porsche have spilled the beans bout a four-cylinder horizontally opposed gasoline engine fitted for a future entry level Porsche model. This new engine is slotted for a spiritual successor to the Porsche 550 Spyder, but will first find its home in the third-generation Porsche Boxster and the second-generation Porsche Cayman. While lacking the wider ranging appeal of the Porsche 911, the Porsche 968 has nonetheless carved out its own niche in the hearts of enthusiasts. This is likely due to the Porsche 968’s unique combination of speed and practicality. Noteworthy drawbacks to purchasing a Porsche 968 as a collector’s car include its visual resemblance to the earlier Porsche 944 model, its status as a late model car, and the fact that the Porsche 968 is still depreciating.